The "New Market" is located by the second class buss station. Here you will find a huge market place including vendors from the surrounding Indian villages. The "Mercado Benito Juarez" just Southwest of the zocalo downtown still sells most of the village crafts along with fruits, vegetables, clothing, leather goods, and jewelry. When trying to get a bargain here, you would be well advised to dress down for the day and remove any expensive jewelry, cameras, & etc.. You should also be willing to make a counter offer for less than you would like to pay -- you may then be able to negotiate a price that you will be pleased with. 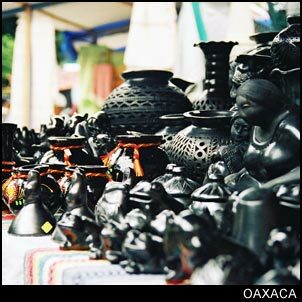 Alcala Street North of Independencia is a pedestrianized shopping street for Mexican and Oaxacan crafts. The prices will be higher than in the nearby villages where the individual crafts are made, but if you don't have time to go to each village to buy a rug here and a piece of pottery there, the convenience of having so many things on one street may be worth the extra price. Santo Domingo: 4 blocks north of the zocalo on Alcala (no sightseeing during mass), considered to be one of the most elaborately decorated churches in the world, dripping with gold taken from the Indians. Basilica de Nuestra Senora de la Solidad: In 1620 an image miraculously appeared in a box on the back of a mule. The church was then built and the Virgin de la Solidad became Oaxaca's patron saint. The church is elaborately decorated and has a statue of the Virgin de la Solidad for the Catholics to pray to. Monte Alban is built at the junction of three broad valleys on the top of a mountain which the Zapotecs leveled off and built a great city which once ruled the entire region. No visit to Oaxaca can be considered to be complete without visiting Monte Alban. For more information on visiting this archaeological site, see our page on Monte Alban. The ancient city of Mitla was occupied until the 16th century when the Spaniards destroyed or dismantled an Indian building in order to use the foundation and many of the cut bricks from the original city to build a cathedral. What we would now call the Town of Mitla grew up around the ruins (and cathedral) which makes an interesting contrast between a once beautiful and great city in ruins and the current city which has never regained the stature of the pre-Spanish era. If you have the time, this is the number two (after Monte Alban) must see site near Oaxaca. For more information on visiting this archaeological site, see our page on Mitla. Cuilapan: The monastery and church which were built here in the 16th century indicate that this was once an important Mixtec population center. If you go, inquire about the little explored ruins on the other side of the Valientne River which contain a pyramid (probably from Monte Alban period 4) built as a consequence of a tomb (as was the reason for one of the pyramids found in Palenque). Dainzu: Though most of this once large city remains un-excavated, what is known suggests that the city was largely contemporary with Monte Alban. The ruins here are currently worth seeing just as much as the ruins at Mitla, and if the site is ever completely excavated, it will become one of the best sites in the area. Lambityeco: Most of this city is also un-excavated, but what has been found so far suggests that the city reached its peak during the decline of Monte Alban (aprox. 700 AD). The human characters sculpted in stucco are probably the most recognizable feature in Lambityeco. Worth seeing if you have the time. Yagul: There is plenty to see at Yagul (thought to be contemporary with Mitla) like tombs, the largest ball court found in the Oaxaca Valley, fretted stone mosaics, the ruins on the acropolis, and the huge defensive walls of the fortress at the top of the hill. A good place to see on the way back from Mitla. Zaachila: The last Zapotec capital from which the names of a number of rulers are known. There is a huge (mostly unexplored) pyramid in the center of town and a series of large stones with hieroglyphs to one side of the main plaza.